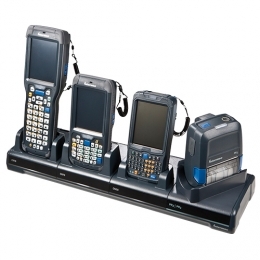 One for all, all in one with the Intermec FlexDock docking station for mobile computers you are optimally equipped. It serves as both data synchronization as well as a battery charger. Connect via USB host and USB client data communication optionally also with a 100Base-T Ethernet port. The flexible system may be easily and individually tailored to both current and future requirements. Thus, you have a cost-efficient solution for maximum productivity through hardware which is always available. Recharge the batteries separately or in the corresponding mobile computer. The chargers may be exchanged at any time, as you wish. Even when changing mobile computers you only need to exchange the corresponding charger - simply use the station further with the new charger. The freely combinable FlexDock stations with two or four chargers are therefore a real investment in the future. Connect up to ten modules to a single network host with minimal cabling via series connection. Optionally you receive a rack mounting set for precise installation into IT racks.